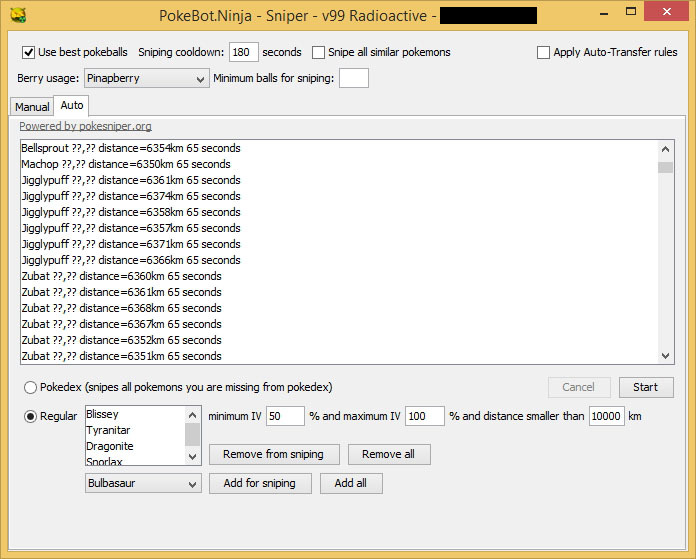 NinjaBot is, hands down, the elite of Pokemon Go management apps including full botting, sniping (with auto feed), and gym battling. For the main part, this screen is fairly self explanatory. Enter your account and password, tick the box to remember it, and paste your API license in the appropriate boxes. If you don't have an API license yet, click the BUY button to get one. 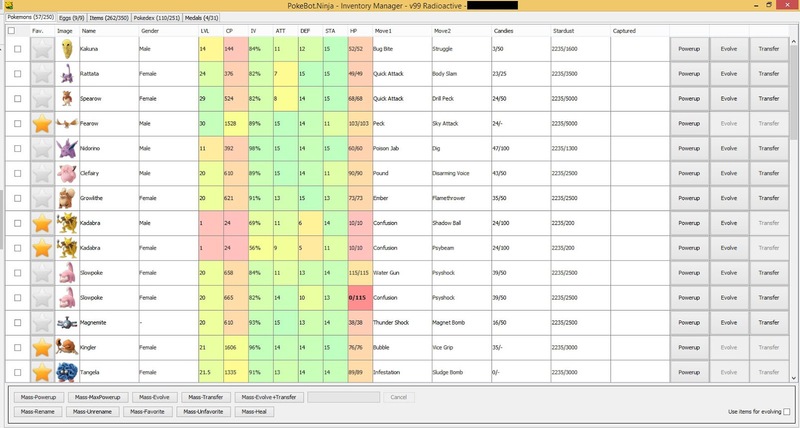 For up to 4 accounts botting, you can get away with a 150rpm license; if you're going to hit gyms, know that only 2 accounts can be battling a gym at any given time under 150rpm license, so you might want to get two. They're only €3.95 which is about $4.50 in US currency. You'll see a button called, "Proxy" in the lower left corner. 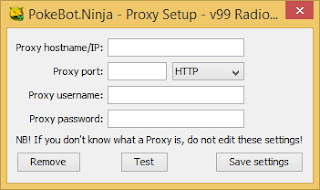 This is a decision you'll need to make - play on your regular IP or hide your IP through a proxy. Setting this up is fairly straightforward. 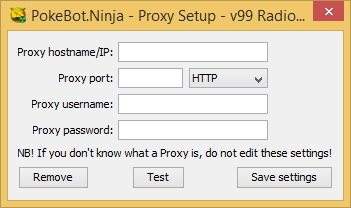 If you pay for a service, you'll have a username and password; if you use a free proxy (such as those listed at proxylist.hidemyass.com) you won't. Click the "Test" button to see if it's working and how well it hides your IP. When you're done, click the save button. 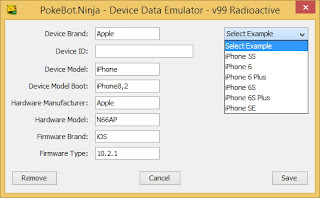 Next, let's look at the Device Emulator configuration. As the game plays, it will likely encounter the occasional Captcha; those annoying "I am not a robot" pop ups designed to stop this very sort of thing. Go to 2Captcha.Com and get yourself an account, toss a few bucks into it (5 will do) and put your key in the app. 2Captcha will automagically respond to the captcha requests for you, in realtime, at a rate of something like a penny each or less. Lots going on here but, again, it's all fairly self-explanatory. The top of the app gives you stats about your account; if you're loading a new account, this will all be zeroes, of course. Two things here to note - you can change your Username, Buddy, and Team by clicking the appropriate links in the header of this dialog. 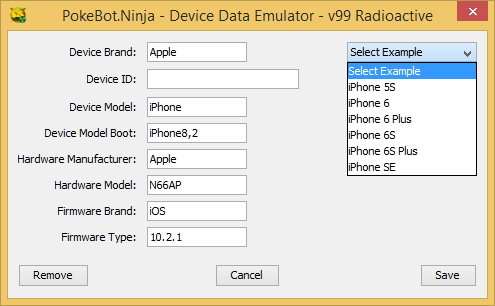 In each case, another dialog box will launch so you can choose or type in the requisite value. The next section is where you'll configure the bot's AI. BTW2 - you did donate to get Radioactive status already, right? If not, click the "Donate" button and toss 20 bucks Mr. Ninja's way. 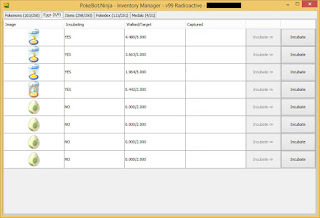 You'll see I have most of the checkboxes ticked; this is because I do full-on botting for my test accounts. I have it catch Pokemon, spin Pokestops, incubate eggs, maintain inventory, and even evolve lower level Pokemon that are really just good for XP. Since these are automated sessions, the Kill Switch is particularly important; I want the app to stop when it hits certain limits, after all. 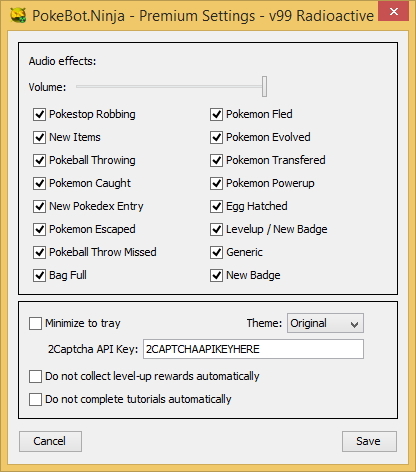 Let's go one by one through these, starting with "Catch Pokemons". 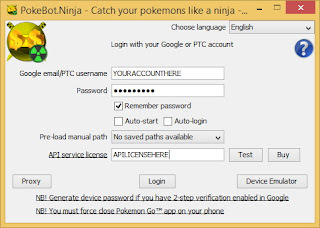 This dialog allows you to choose how the bot will catch each Pokemon it encounters. 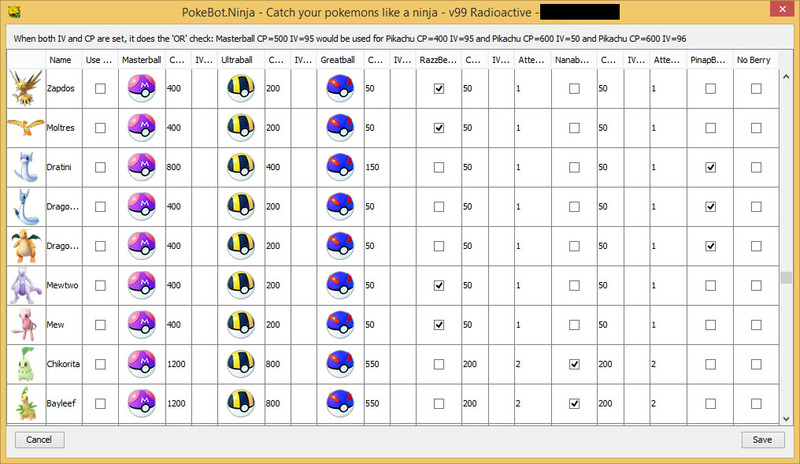 You can override the use of balls and choose which to use depending upon the IVs of the Pokemon. You can also choose which berry to use. For example, I might want to always use an ultraball and razzberry when I encounter a Tyranitar, but only use a regular ball and no berries if it's a Pidgey; this is where I would set that up. Initially, you can just go with the defaults here or you can start to tinker right away. I have terrible luck with lured stops so I don't use them. The default for this is unchecked as well. Egg incubation is also pretty simple. I want to auto-incubate any eggs I get but I only want the bot to use the infinite incubator on 2km eggs. 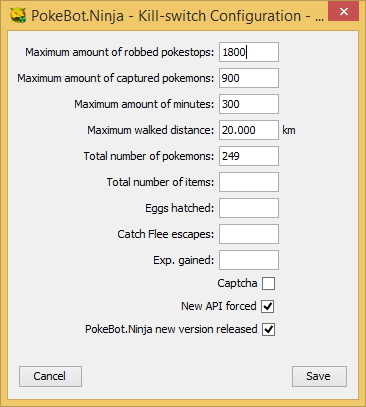 I might go in and use limited incubators myself on 2km eggs...I'd rather not let the bot make that decision. You can always start eggs incubating manually from the inventory manager as well. Your items bag can only hold 350 items to start. 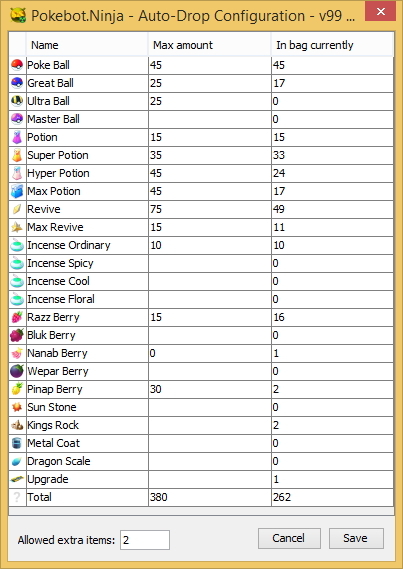 As a new player, you want to focus on having enough balls to catch Pokemon; revives and potions aren't too important. 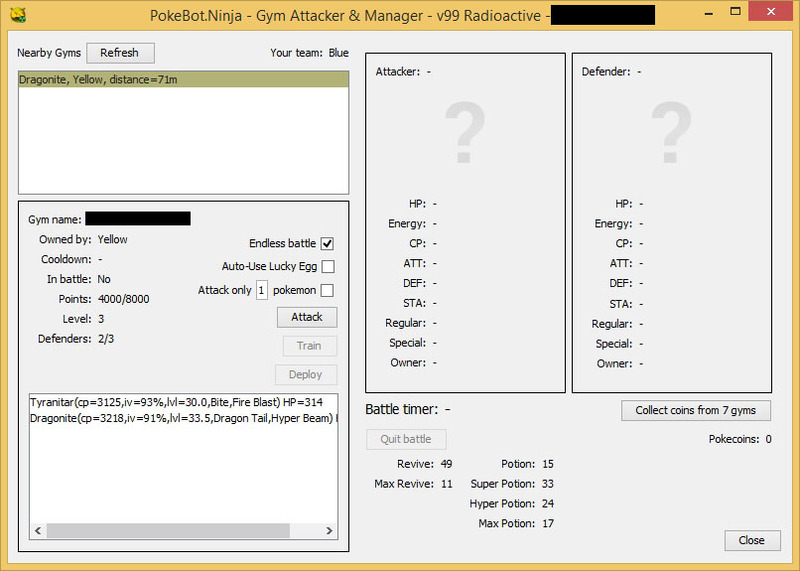 So, you configure to keep lots of balls and less revives/potions. 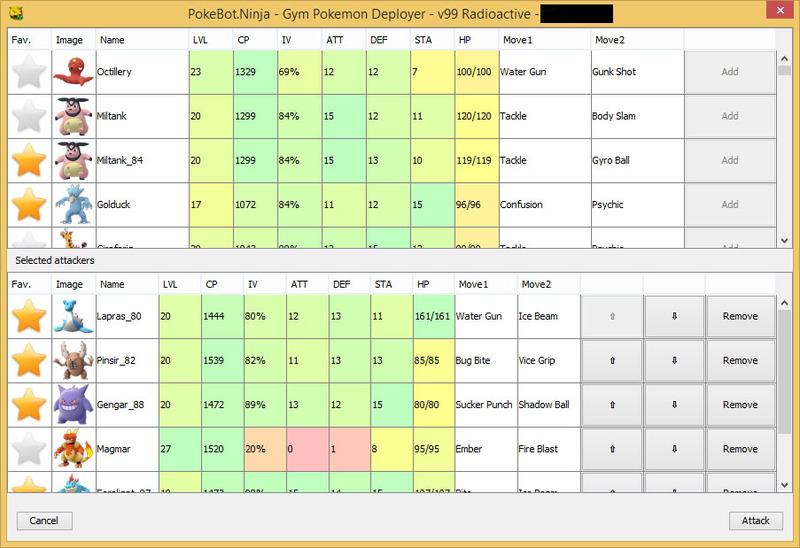 Later on, when you start playing the gym game, you keep less balls and more revives/potions. Managing your catch inventory is just as important. You have a 250 Pokemon capacity; some you might always want to keep (like Gastly and Abra/Kadabra for the Gastly strat, or the big gym defenders) while there are others that are really just XP fodder (like Pidgey, Caterpie, Weedle, Natu, Sentret, and Spinarak). Here you configure whether to flat out ignore some types, keep them, evolve them, or transfer them outright. Below this you'll see an Auto-Transfer checkbox. This works in tandem with the Auto I/E/K/T. You can set the app to always transfer anything not being kept and base it by IV or even a combination of CP, Level, and IV. There are limits to how many stops you can spin and Pokemon you can catch; this is the case regardless of whether you're using a third party app or the official app itself. Likewise, you should limit the distance you walk in a single session and have the app quit if it reaches bag capacity, a new API is forced, or a new version of the app is released. NinjaBot knows to not spin stops when the items bag is full, but you can put a value here as well if you like. That's it! 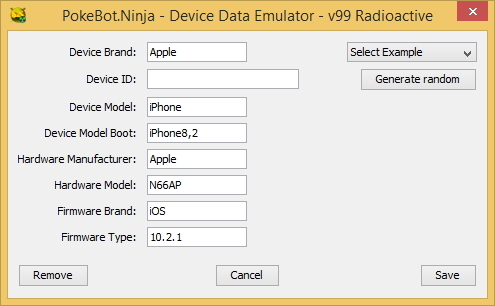 Your NinjaBot is now configured and ready to go! 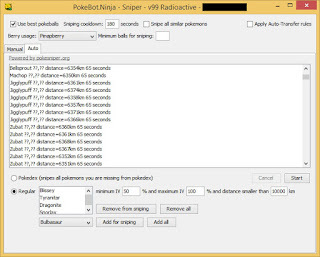 Now you just need to put in your starting coordinates, movement pace, and start catching. 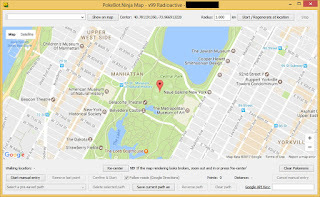 Where you bot is up to you. I typically stayed local (downtown or nests) but other players go all over the world. Just remember to account for travel time if you move from place to place. 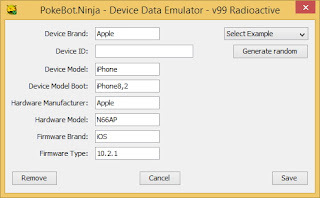 Ninjabot will travel within a pre-defined radius so you want to plug in a lat/long coordinate pair that is the center of a circle. If you need to get a better idea of what the range would look like, use the radius tool at FreeMapTools.Com; give it coordinates, pick a radius, and it literally draws it on a map for you. The pace you select is reflective of how fast you want to get around. A lot of bots seem to like 3m/s; personally, I think that's too fast. The average person only walks about 1.4m/s; 3m/s is a REALLY brisk walk, or even a jog. My preferred setting here is 1.2-1.4. Now click the "Map" button. In the lower right-hand corner, you'll see "Google API Key". Click the link and you'll be taken to the site where you can generate a free map key. 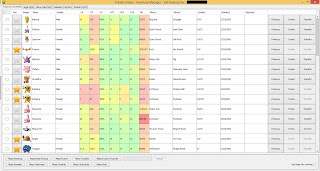 This is necessary for the map to work and you'll want to copy it out to a text file or spreadsheet somewhere. The map allows you to choose where your range will center itself. In this example, we're in Manhattan, at the park. 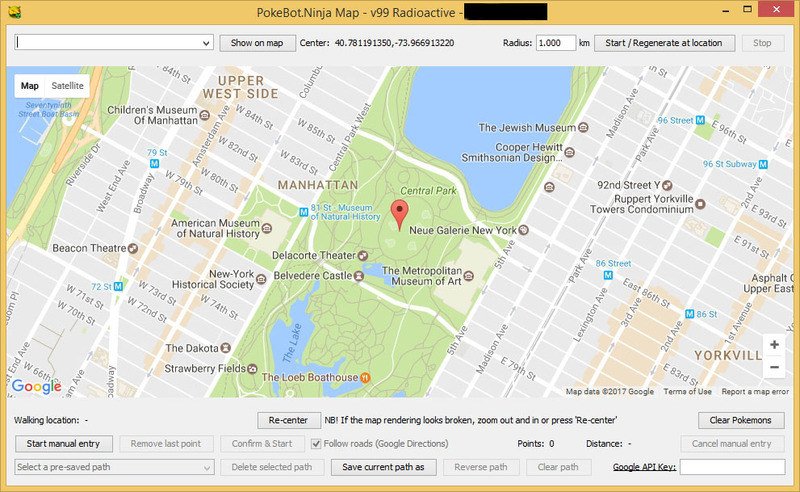 If you click, "Start/Regenerate", the bot will begin its game where the red pin is located. It goes out to the game servers, pulls down a map of stops, and auto-generates a route between the stops, catching Pokemon along the way. If you like, you can create your own path and even have it adhere to mapped streets and pathways by selecting "Start manual entry". If you create a path you want to reuse, be sure to save it BEFORE you hit "Confirm & Start". You can also move around on the map by dragging or using the arrow keys on your keyboard. The manual entry is particularly useful when you play the gym game; you can zoom in on a gym, pin the gym, then walk to it and click the "Stop" button when you're on top of it. Back on the base, console dialog. 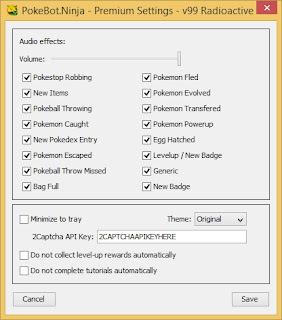 You'll see "Start Catching" and "Stop Catching" buttons. You can use these when you want to pause/restart the bot. 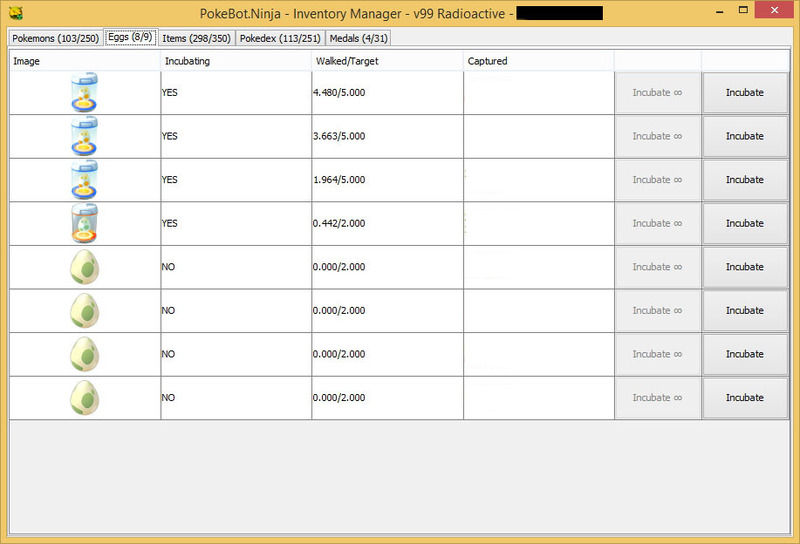 If you want to manage your inventory, you'll have to stop the bot to do anything (drop, transfer, evolve, favorite, etc). 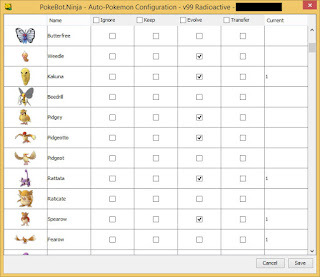 You can manage your entire Pokemon inventory from this screen. Everything you need to know about your Pokemon is right on this screen - favorite status, name, gender, level, CP, IVs, even current HP (bright red if feinted), attacks, candies you have, candies you need to evolve, and even when you caught them. 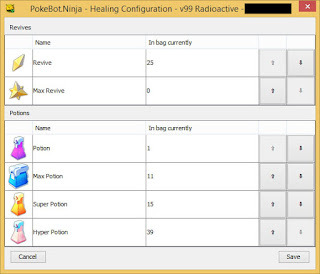 The menu below acts on Pokemon you select to power them up, heal them, and so forth. 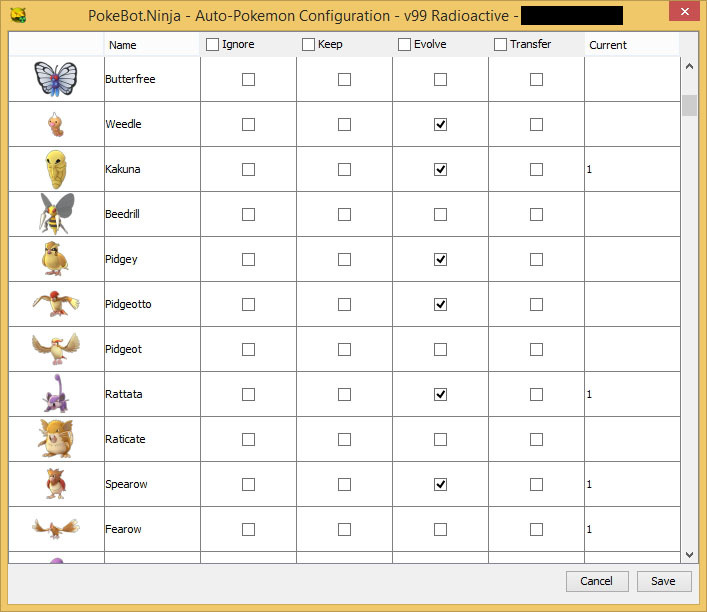 (Worth noting - when you select Pokemon, they stay selected; even if you do something on them.) You can do mass transfers here too. The buttons on the right allow you to power-up, evolve, or transfer individual Pokemon. Be careful what you choose here; you don't want to be using regular potions to heal a Blissey if you can avoid it! This shows you when you caught the egg, what kind of egg it is, and if it is in an incubator or not yet. You can also manually choose to start incubating. Here you see what you have in your current inventory. You can drop items and use things like Incense or Lucky Eggs. 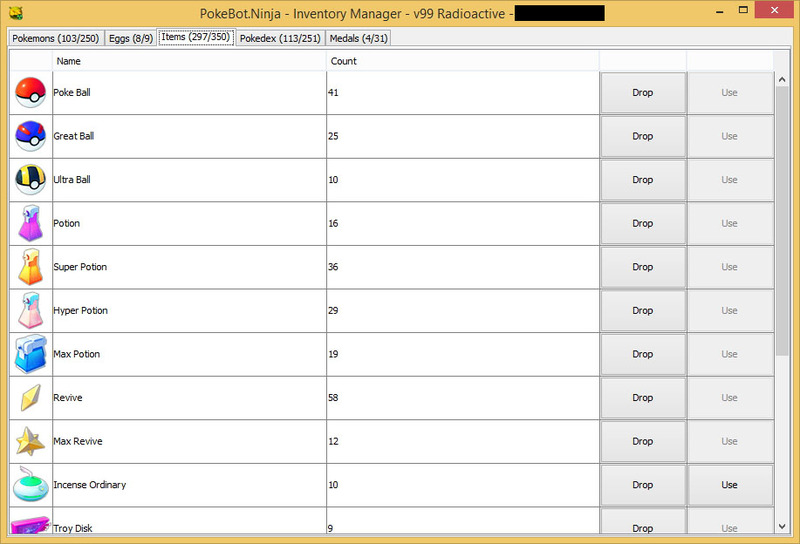 The other two tabs show you the current state of your Pokedex and any medals you've earned. Anything you can afford will be colored; click the item, then "Purchase" and it will be added to your inventory. That's the configuration and basic usage of the app. Let's move on to the REAL fun - sniping and gyms. Sniping is one of the features where this app really shines. 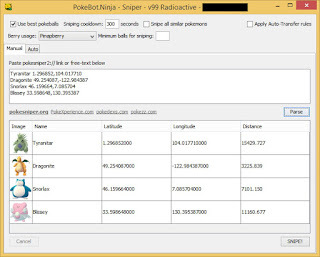 There are feeds available in Discord (like PokeDex100) that will provide coordinates to high IV, hard to find, and other Pokemon all around the world. Many come from scanners but others are provided by players. 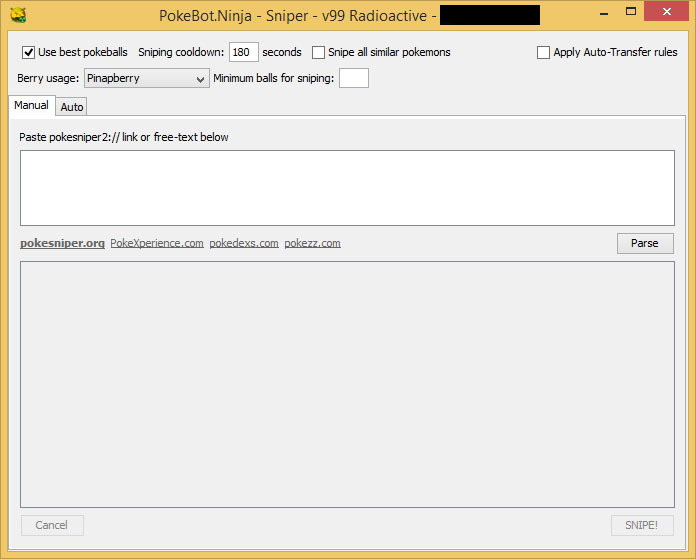 Ninjabot supports both manual sniping and an auto-sniping feature that comes with the Radioactive version. The defaults on this screen are generally good, but I do recommend setting a sniping cooldown of 300 seconds. You can go for less if you like (or more) but this one seems to work well for me and it allows regular catch-time in between snipes. 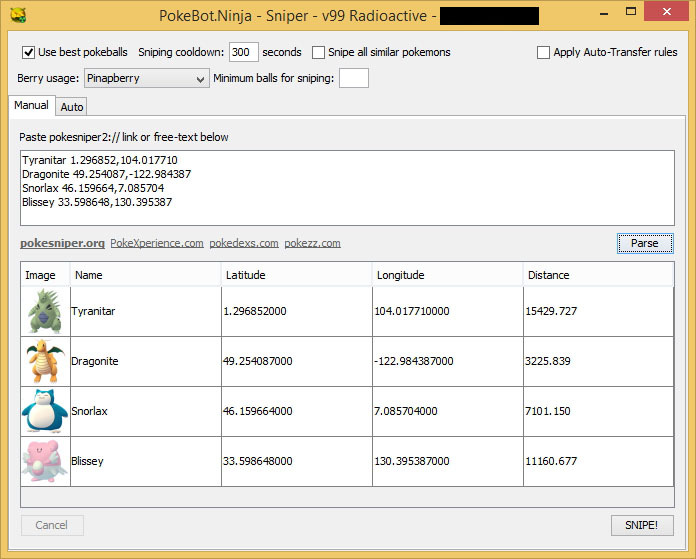 NinjaBot tells you how far away the Pokemon is too; that way, you can stay in-country if you like. Once you click the "Snipe" button, the app will continue to play its regular game, pausing to snipe every 300 seconds (5 minutes). The snipe is a teleport, start-catch, return, finish catch; just like regular spoofers do it. The app is configured to pull a feed from one of the scanning groups. Here you can have it just finish off your Pokedex, or you can have it hunt for things you need/want. For example, if you're into the gym game, you'll want the four top defenders - Blissey, Tyranitar, Dragonite, and Snorlax. Choose each, one at a time, and add them tot he sniping list. Next, choose the minimum and maximum IV and how far out you want the auto-sniper to go. 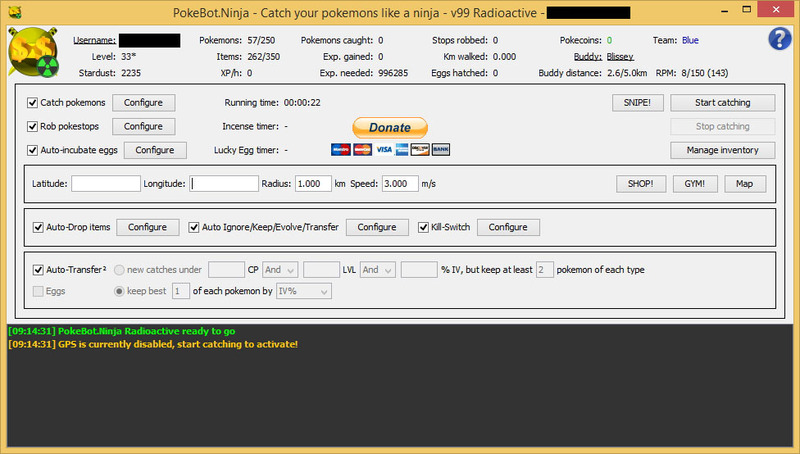 Click "Start" and walk away; NinjaBot will do the rest. Of course, sniping is one of the more prevalent ban dangers, but you're probably not worried about that because you know you'll likely be losing this account in a month anyway. Since it only takes a few days to build a solid account anyway, a lot of players don't worry about it. Your call. This is your basic, Gym Manager screen. 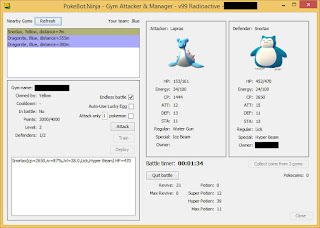 It shows you nearby gyms and, if you pick one, details about the gym and any defenders. (You also collect coins each day from this screen.) 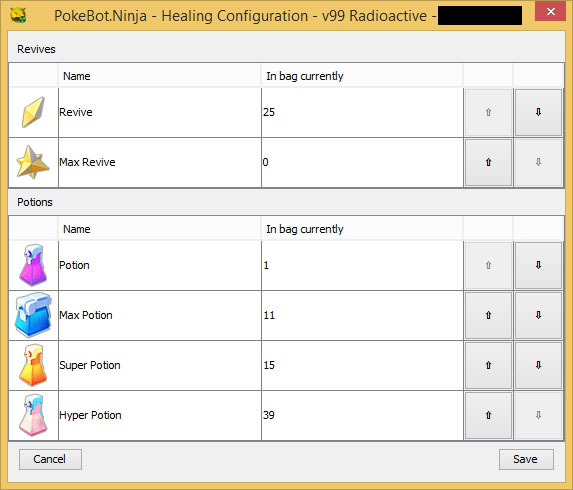 A nice feature recently added is information on your revives and potions. First thing to take note of are the check box items - "Endless Battle" will just keep reviving/healing then attacking. "Auto-Use Lucky Egg" will keep using those Lucky Eggs for maximum XP (especially useful if you want to strat a new account). The last item, "Attack Only *** Pokemon" lets you restrict how many defenders your squad will attack before it quits (and starts over, if you have Endless Battle ticked). Click the "Attack" button on this dialog and your attack begins! 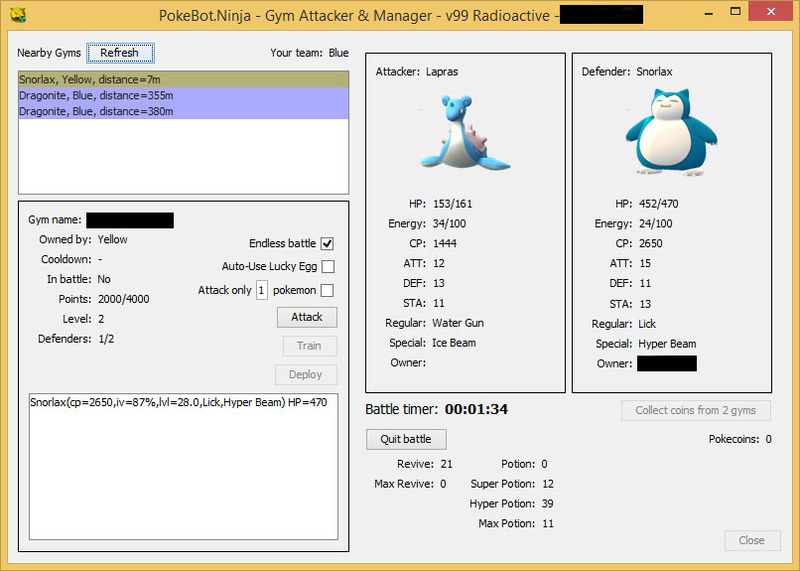 To train the gym up, you follow the same basic process but click "Train" instead of "Attack". 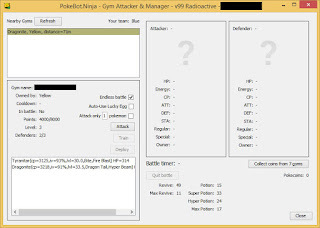 If you're going to strat the gym up, be sure to tick the "Attack Only 1 Pokemon" box. If prestiging against regular Pokemon, you'll want to keep your attack squad to about half the average of the gym (know that the highest CP Pokemon you choose is the one that the formula uses to determine how many prestige points you get). And there you have it - a tutorial in setup and use of the most complete, third party, Pokemon Go app in the wild. Standard warning here - never, ever use a third party app on your main account. These apps operate outside the gamer guidelines and accounts used with them are typically banned; some sooner, some later. Sometimes it's just fun to push the envelope a bit. As new updates come out, I'll sneak back and update this posting as well. I also do recommand not using them if you don't need it, especially the tutorial part i would not skip. IF you want some nice battle accounts: "Do not collect level-up rewards automaticlly" is a must. - There's no problem using this, it's not a ban/captcha trigger. - It will not collect any reward for leveling up! Screenshotis an one of my (Gym battle) accounts i botted to level 30, once reached level 30 i botted in the closest town with lotsa pokestops and didn't catch pokemon, only robbed pokestops till my bag was full till 349 (like set in the screenshot). After that i logged in on my real phone and the account got to level 30 asap, collecting all level up rewards, leaving me with lotsa overitems like in the screenshot. 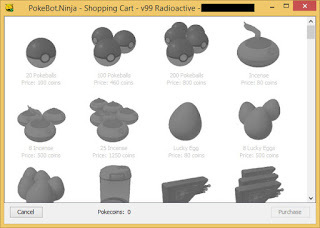 - Once you have a full bag, deselect "Auto-Drop items"
Now if you want your account for battle in Pokebot.Ninja on your login screen, click on the pokebot ninja icon and deselect "Do not collect level-up rewards automaticlly"
- It walks 2Km eggs only with the unlimited incubator and is locked to only use the unlimited incubator, nothing else. - It walks 10Km eggs only with the limited incubator and is locked to only use the limited incubator for 10km eggs, nothing else. - It walks 5Km eggs with the unlimited incubator, only if i don't have any 2Km eggs, because i didn't use "lock preference"
I know, but i don't use 2captcha cause it doesn not accept paypal direct and i don't want to setup another payment methode (i try to use as less as possible online payment methodes/needing bankcards. (05-02-2017, 12:46 PM)Pegger Wrote: I know, but i don't use 2captcha cause it doesn not accept paypal direct and i don't want to setup another payment methode (i try to use as less as possible online payment methodes/needing bankcards. I can't manage items or pokemon manually. even if the I click on the tab (for example USE incense, or TRANSFER a pokemon) they don't work.. am I missing something? 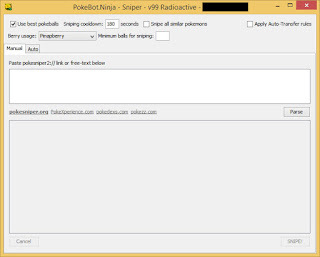 I heard a lot about NInja bot for Pokemon Go management, I can't get this tool, Can you help?